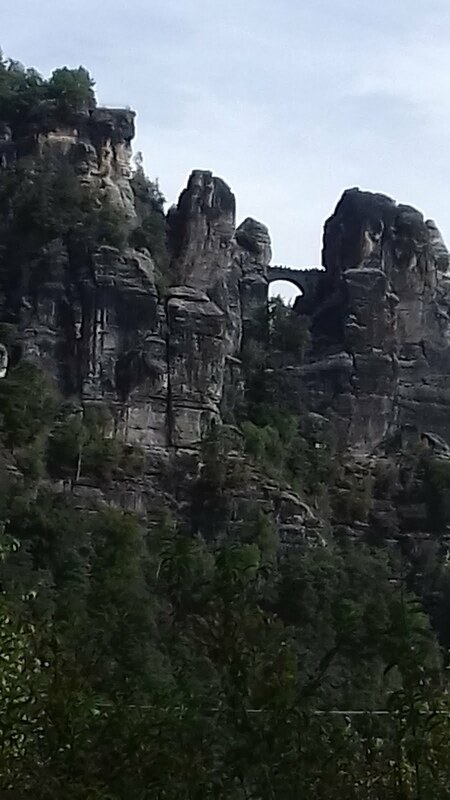 This morning we packed up after our 4 day stopover at Struppen with a plan to visit The Bastei - a bizarre rock formation on the banks of the River Elbe that is composed of ‘inselbergs’ - tall rocks that rise abruptly, and which for tourist purposes, are now connected by foot bridges to enable you to cross from one to another. To get there we would have needed to cross the river by ferry and then walk into the range, however when we arrived it seemed like every teenager in Germany had got there before us! There were thousands of them crowding on the ferries and then clustering on the far bank, and as we looked behind there were more on their way! 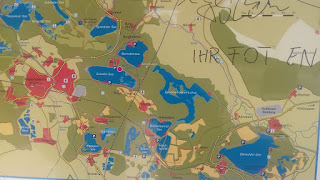 Thus our plan was quickly revised, and we moseyed on down to Zittau - a town that is on the Czech/Germany border, and right on the edge of the Zittau mountains were numerous walking trails are available. 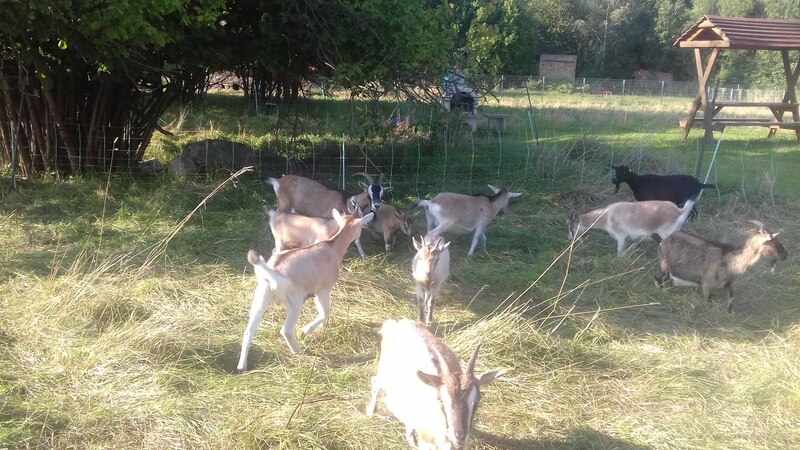 The Zittau Stellplatze therefore, provided a very convenient home for the next couple of days, and with it's huge grassed area and uninterrupted sunshine we quickly made ourselves comfortable. And for additional entertainment there was a large family of friendly goats, and just outside the boundary, an old train trundled by tooting and puffing steam as it went. We also met this character in to loo! 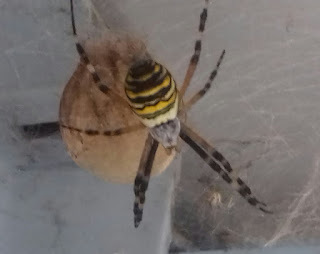 Google informed us it was a wasp spider and apparently it’s harmless to girls, but it eats boys for dinner! Wednesday 7th September 2016 - Very hot sunshine right form the word go! This morning we decided to go up into the mountains but we thought it would be too hot, steep and far to cycle, so we went in T4rdis2 aiming for the spa town of Oybin. However, parking was our first problem - there was just nowhere that we could safely leave our ship in the town! 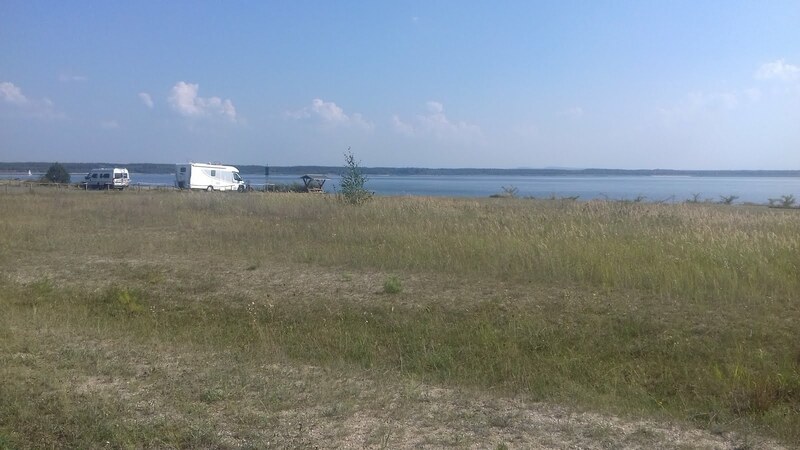 But maybe this was to our advantage in the end, because we hadn’t gone far out of the town when we came upon a woody glade that provided an excellent spot and it was free. Then we were soon on our way, mostly trekking along wooded paths admiring some very strange rock formations as we went. Next came the very pretty town of Oybin, and it really was just like something of a chocolate box - the houses had wood carvings and flowers flooding from their balconies and there were numerous shops and cafes trying to entice you in. However, it was to early for a coffee break, so instead we mounted the staircase that led upwards (for over 200 steps) towards the ruins of a Gothic abbey. 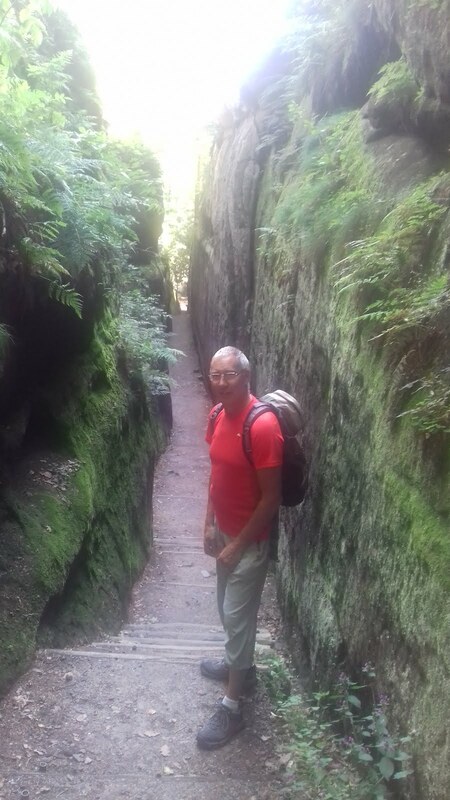 Then, after a little exploration it was back down again, but this time we pottered though a natural chasm that had formed between two high rock faces resulting in a dank dark tunnel. On the way down we also took the time to explore the little mountain church - it looked nothing much from the outside - but once in it was quite jaw dropping, especially in relation to it’s construction. 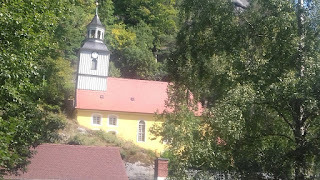 It was built in 1732 and not only is one of the walls formed by part of the rock face, the floor followed the contour of the fall of the hill resulting in the pews being steeply tiered. 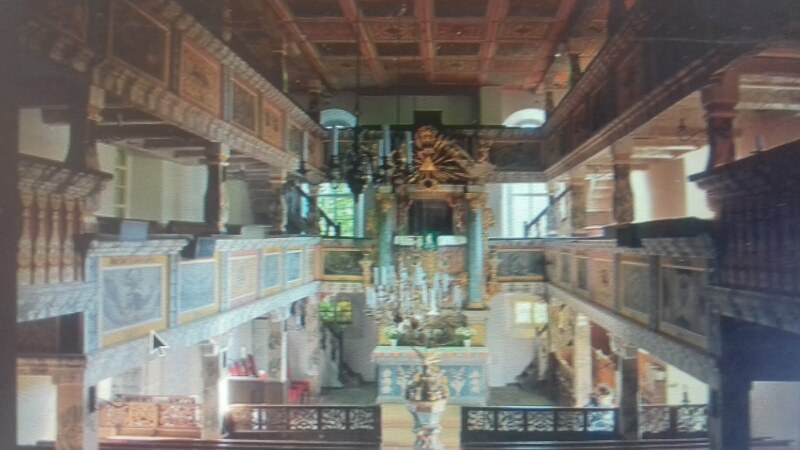 We also learnt that over the years it has been renovated many times, with two high galleries being added and a special organ from Zittau. However, one of it’s more interesting features were the frescos that covered it’s walls ceiling and galleries - apparently, due to lack of money, local artists contributed to much of this work resulting in a quite unique finish. 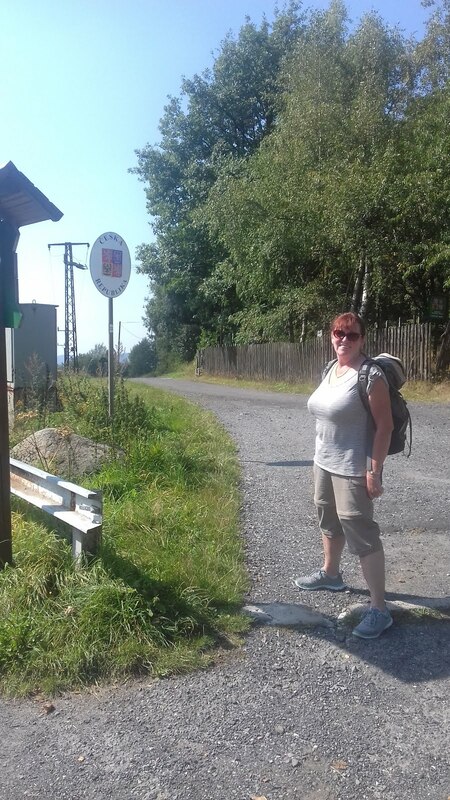 And that really provided the highlight of the day because the rest of our walk was mostly through thick forest that followed the Czech/ German border, and on more than one occasion it was possible to stand astride it and be in two countries at the same time! Eventually, the trail led us back to T4rdis2, and although it was still quite early (3ish), we’d had enough of walking because it was so hot! 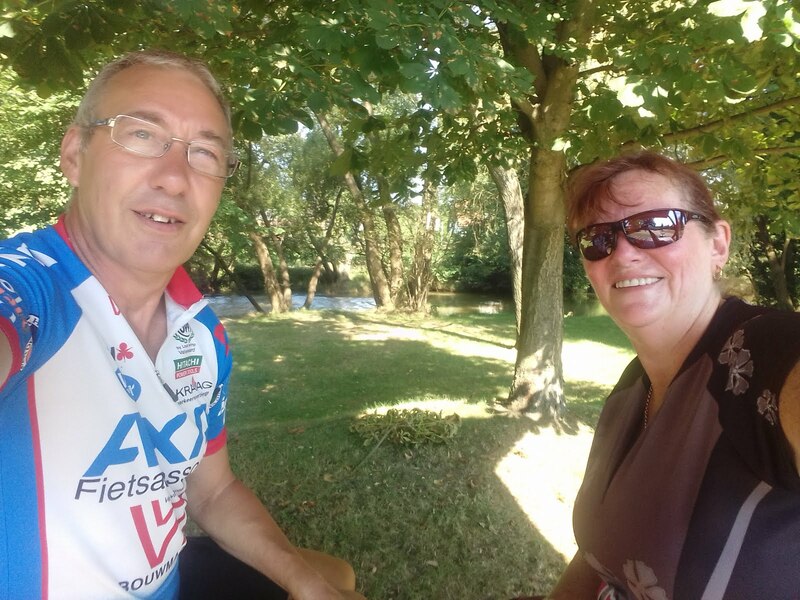 Therefore, we quickly made the return journey to Zittau, got our chairs out and sat in the shade as the afternoon slipped by. This morning we left Zittau after a quick shop in Kaufland - one of the biggest hyper-markets we’ve come across since being in Germany. 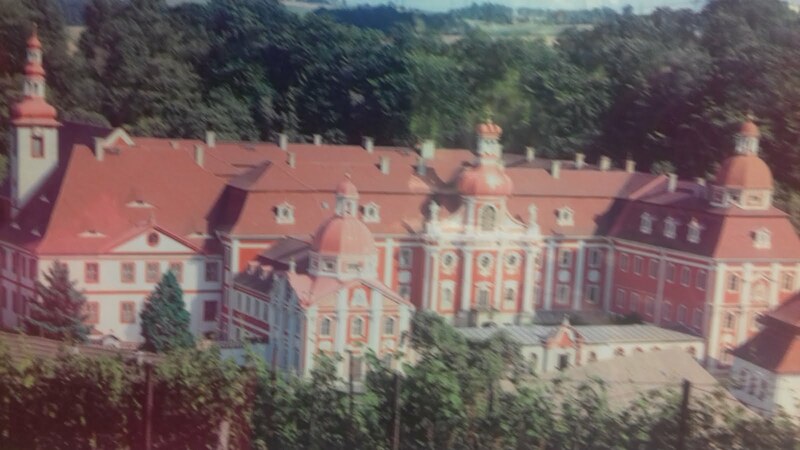 Our target for today was Ostritz - a village famed for it’s 13th Century Cistercian Abbey - St Marienthal, which to this day, is still occupied by nuns. Obviously the buildings on the site aren’t the originals, and quite early in our visit we learnt that it has had many tribulations. It was founded in 1234, then in 1683 it was destroyed by fire, requiring it to be rebuilt in 1744. In 1897 the interior of the church was destroyed by flooding, and more recently in 1945 the Abbess refused to follow orders to evacuate, thus preventing the building from being blown up. 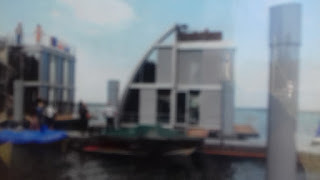 In 2010 it was again severely damaged by flooding and required 15 million euros to be spent on it’s renovations, work which wasn’t completed until 2014. 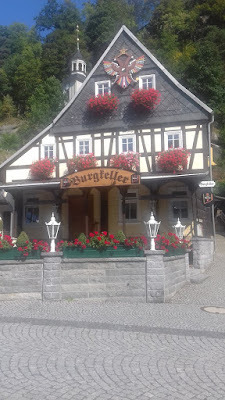 Today, the building surrounding the convent are used as hotel and restaurant facilities, but we were also quiet interested in the Abbey shop where we had read the nuns sell home brewed beer. 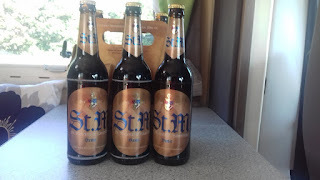 It would have been rude not to purchase a sample, so as I sit tapping out this story we are also sipping on a little drop of their best ( blessed ) Dunkel - and very nice it is too. 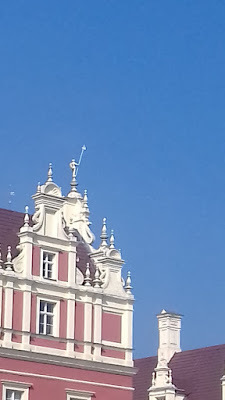 Then, after a spot of lunch we continued on our way to Gorlitz - another town that is steeped in history, but again, parking was difficult and compounded by busy traffic and lots of road works. Therefore, we didn’t stop (you really do only want to look at so many historic buildings!) 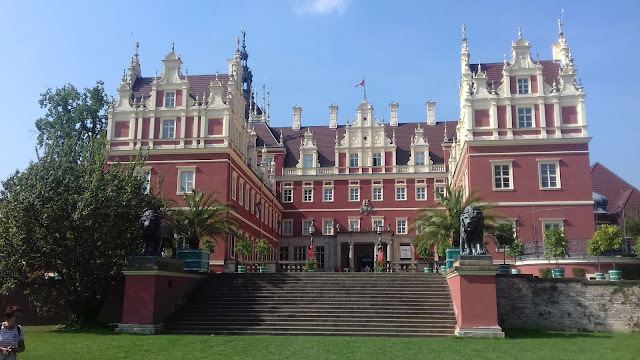 but continued on our way to Bad Muskau where we’re hoping to find one of Saxony’s most beautiful parks - it’s UNESCO listed so hopefully we’re in for a treat. 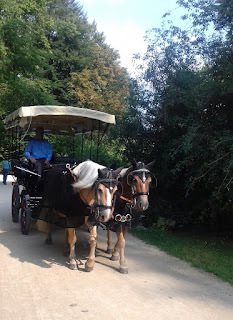 Well we certainly weren’t disappointed and we’ve spent the last 2 days exploring the lovely Muskauer Park that is split by the River Neisse, resulting in one side of it being in Germany and the other in Poland. We learnt that the park was created by Prince Hermann Von Puckler- Muskau between 1815 and 1845, but it was a project that he dedicated his life to, resulting in the nick name ‘Parkoman’ which more recently has been changed to ‘Parkomaniac’. To do the park justice we decided we’d spend Friday (on foot) exploring the German side, and because the Polish side was a bit further away, we cycled there on Saturday. On the German side, one of the most striking features is the ‘New Palace’ - apparently the Neo-Renaissance one that initially occupied the site was destroyed in World War 2, but the stunning building that we found was reopened in 2008 following it’s reconstruction. And it really is a Masterpiece - with 2 huge lions guarding it’s frontage, and a roof that is covered in figures that look like chess pieces but who also serve the purpose of lightening conductors. The interior of the building provides a museum and a tourist information office from where we were able to purchase a map of the park that gave us lots more back ground info and guided us around so that we didn’t miss anything! 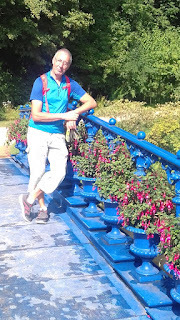 As we wandered we found pretty flower filled gardens, picturesque lakes, streams and waterfalls, elegant bridges, lots and lots of winding paths and meadows and numerous ancient oaks along with many other old broad leaf trees that filled the area with shade and gracefulness. Additionally, although there were plenty of people about it was far from busy, and modes of transport included walkers, bikers, and maybe more surprisingly, a good number of horse drawn carriages carrying people around the delights of the parkland. 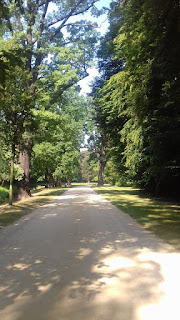 On Saturday we crossed over The English bridge (destroyed in 1945 but rebuilt) into Poland to complete our explorations, and although this side had it’s own charm, we much preferred the open parkland in Germany. On this side of the River Neisse the forest was more dense and there seemed to be fewer points of interest, but it did provide a very pleasant place to ride and it allowed us to tick another country off our list of places visited. 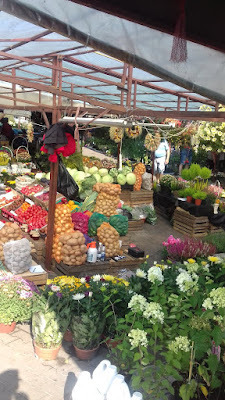 While we were there we nipped into the town of Leknica - we found it to be a hive of activity with it’s huge flower fruit and veg market, but we didn’t buy anything because it all seemed to come in giant sized packs (the cabbages where huge) and anyway, we hadn’t got any Zloty! Now, we had whistled around the Polish bit of the park quite quickly, so to fill our day we decided to cross back over into Germany and explore a little further along the banks of the River Neisse where we knew there was a dedicated cycle track. In total we managed about 46 kilometres, sometimes in forest, but only occasionally beside the water. However, it was another pretty place to ride, and as we had the track almost entirely to ourselves it was very peaceful and enjoyable in the warm sunshine. 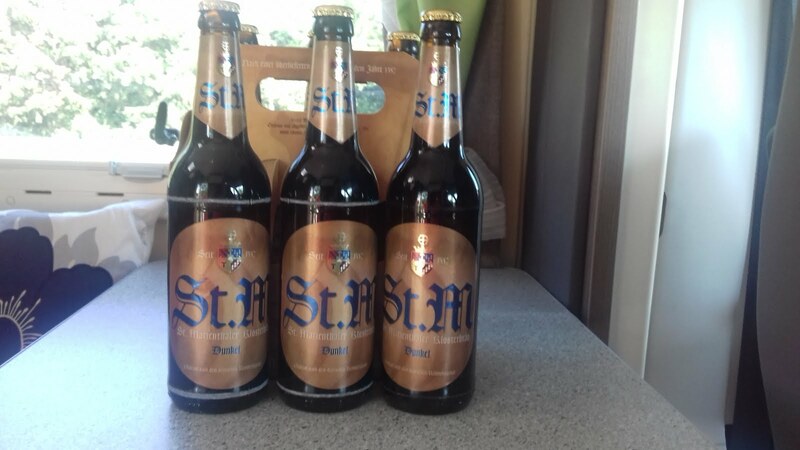 We arrived back at the Stellplatze quite early - only about 4ish, but we're really getting quite good at lazily whiling away our time - sitting in the sunshine, dozing, planning, blogging etc, and of course, sipping the last drop of the nuns beer! 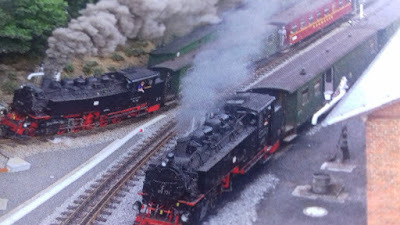 Sunday 11th September 2016 - Almost at boiling point! As we left Bad Muskau this morning I thought it might be just a tad cooler today - WRONG! What bit of cloud there was burnt off very rapidly, and by 11am the temperature gauge had reached 30, (do I sound as if I’m moaning), so maybe our choice of places to visit wasn’t the best. 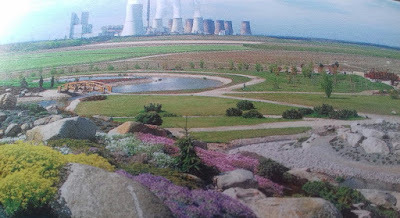 We had chosen The Boulders Park/Garden at Nochten - a place that used to be an open cast coal mine, but between 2000 and 2003 the area was converted from a barren landscape to a garden which is apparently unique in Europe. The garden is set out with stone formations that are surrounded by a huge variety of blooming plants - but as the season was late when we visited only the numerous heathers were doing there best to provide colour. Therefore, this along with the lack of any shade and the sweltering heat, probably shortened our visit and encouraged us to continue on our way to the Lohsa Stellplatze where we planned to spend the next couple of nights. 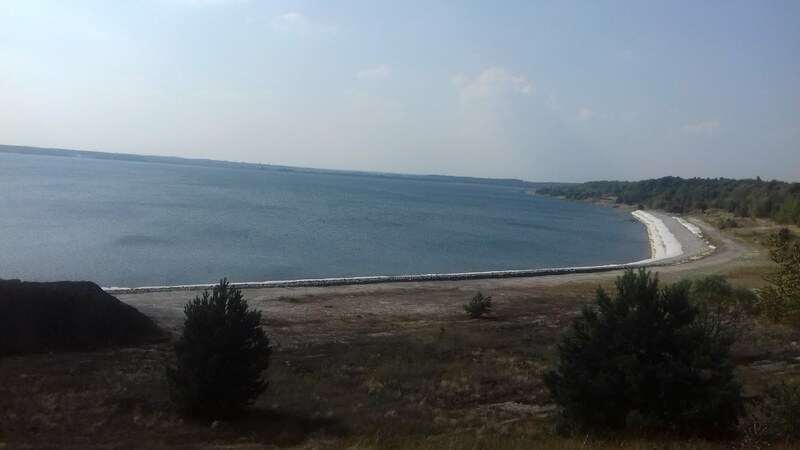 And what a lovely setting we found that in - we’re right beside Lake Dreiweibemer-See overlooking a very busy little beach which was well populated with bathers when we arrived. Additionally, the Stellplatze was nearly full, but we just managed to sneak into a spare spot at the far end, however what we hadn’t realised was that this overlooked the ‘naturist area’ - it makes for quite interesting people watching - but it must be said ‘ there ain’t many “ Buff Dudes” here. Monday 12th September 2016 - The temperature is still rising (31 degrees), and not a cloud in the sky! 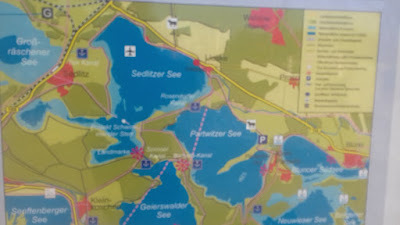 This morning it was bikes out and off we went with a plan to cycle about 45 kilometres around 2 of the lakes - Bernsteinsee and Scheibe-See - and nearly all of it was to be on dedicated cycle track. And mostly our plan worked very well - we toddled along with a pleasant breeze that we were creating as we went to keep us cool. We found lovely picnic spots for our breaks, and as the routes were fairly well signposted we didn’t really have any problems with finding our way. However, I’m sure you can tell there’s a ‘BUT’ coming! At about kilometre 40 we’d drank all our pop and eaten all our food - but we were still very Very far from home and there didn’t seem to be a shop or cafe open anywhere. On we plodded, happily quite distracted form our thirsty state by the fantastic views, but as the miles piled on we started to chat about nice cool drinks, so when we passed a young chap on the track side gulping from his bottle I really thought John was going to reach out and grab it out of his hand! Luckily, he did manage to restrain himself and it wasn’t much further before we reached the ‘Penny’ supermarket where I raced in and grabbed a 1.5 litre bottle of nice Lemon iced tea - it was gone in a flash and hardly touched the sides - and I must confess a little drop of beer also managed to jump into my basket - well we didn’t want to end up suffering form dehydration! In the end our ride was 68 kilometres (42ish miles) - a little over what we had originally planned, so I think the beers, along with the big bowl of tomato pasta that we ate for supper were well earned. After our mammoth ride yesterday we’d decided to have a fairly easy day today. Shopping needed doing and we wanted to move onto another part of this German Lusatian ‘Lake District’ - Geierswald. So, after quite a late get-up (9ish) we set Mrs Sat Nav for the nearby Kaufland, and armed with my list we entered - and what a traumatic experience that turned out to be! Maybe because, in recent times, I’ve quite got used to getting all our provisions from much smaller shops like Lidl and Aldi, however, this place seemed to be as big as at least 4 football pitches. So when I checked my shopping list at what I thought was the end of our visit, and realised I’d forgotten a few items, it was a major reroute to find them - we emerged nearly 2 hours later - and it seemed to have cost a small fortune. Then, to add insult to injury, all the drinks including squash, pop and beer etc were located in a completely separate store - so we had to do it all again! But eventually, we exited triumphant and T4rdis2’s cupboards and fridge where once again well stocked, and it didn’t take us much longer to get to our next sleeping place where we planned to stay for at least 2 nights. On arrival we were greeted by a very pleasant German gentleman who hardly spoke a word of English, but mostly, by using sign language, odd words and a few gesticulations he managed to convey the necessary info to tell us the price for stopping and how far we could expect to ride on several different trails around the lakes. He also gave us a map which had additional information about this lovely area. It confirmed some of what we already knew - that this region of lakes is currently being developed and created utilising the sites of redundant open-cast mines that have been flooded, but what we didn’t know, was that this now forms the largest artificial lake-land in Europe. 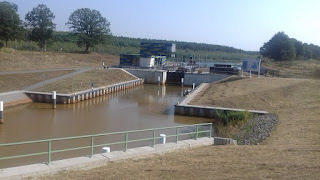 The vistas are magnificent and the shore lines of the lakes provide swimming beaches and marinas as well as miles of cycle paths, and additionally, navigable channels with locks are also being created so that at least 10 of the lakes are linked for boats. So tomorrow it will be more cycling - but maybe not quite as far as yesterday! This morning we soon had our picnic packed and were off out on our bikes. So what more can I tell you about this delightful area - we rode about 53 kilometres all on tarmac and mostly dedicated trails. For much of the time our views were spectacular and the shores of the lakes were littered with lots of people enjoying the sunshine, as well as numerous picnic sites and interesting notice boards that provided more information (in German) about the ongoing projects in the area. We saw the inter-linking locks and canals being constructed and noticed additional development in the form of floating holiday homes that apparently are a signature feature of this Lusatian Lake-land. And despite all the ongoing development, none of it was intrusive - it really is a fantastic place that seems as if it will only get better in years to come. So, our big decision, after a thoroughly enjoyable ride is shall we stay or shall we move on - we haven’t got any fixed timetable so we’ll make our minds up in the morning! Thursday 15th September 2016 - Mrs sun has got her hat on again! Well, neither of us slept very well last night - we often don’t after a long ride! 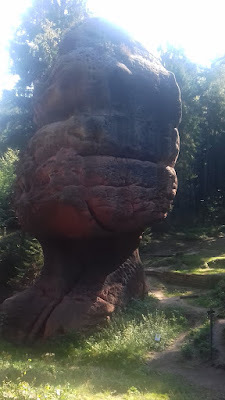 So, even though it has dawned ‘another perfect day in paradise’, we’re going to move on towards Dresden - and hopefully we might even find a wifi signal so that I can publish this saga before it gets any longer. I think our ongoing lack of Wifi is something to do with ‘sods law’ - our provider ‘3’ has recently included Germany, along with quite a few other countries, in their ‘Feel at Home Package’ which means that we can now use our data contract without incurring any extra cost, but for the last week or more we’ve been ‘out of range’ and not had a signal, so it’s not really been much use to us! Hooray, as you can see we have finally got a Wifi signal! We're parked up on a campsite (that is packed) near Dresden so tomorrow we plan to catch the tram into the city and see the sights.